Spago, the original gem in Wolfgang Puck's culinary crown, is a fine-dining restaurant without the pretense. If you're not sure what to wear, though, or where to sit, or if you have other questions about the experience that have not yet been answered, please read on. Because this restaurant is so popular, not only with the celebrity set, but also with business people and ladies who lunch, reservations are strongly recommended. Spago takes reservations for the current and next month; on the first of each month, the staff will begin accepting reservations for the next one. The seating for 277 at this 11,500-square-foot restaurant is intimate. 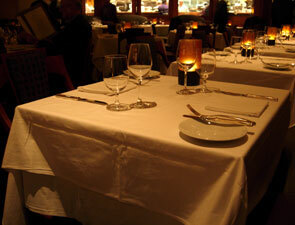 Tables for two are spaced very near one another and are sized at about 30 inches square. Chairs are ample, and angled for a more comfortable dining experience. There is banquette seating available in addition to upholstered wooden chairs, both with and without arms. The atmosphere at Spago is jubilant, as is any place frequented by Hollywood's who's who. It's not the place to go for a quiet romantic meal, but rather to see and be seen while enjoying some excellent food. While the restaurant is mood-lit and comfortable, because there are so many tables, you might want to save private conversations for later. Music - recorded, not live - plays throughout the dining room; during one visit, to the restaurant was playing The Rolling Stones by 7:30 p.m. The restrooms are easily accessible off the main dining area. Although the dress code is technically sportswear or casual clothing, you'll likely notice that Spago attracts a slightly more dressy crowd. Jackets and ties are not required, though a gentleman might feel more comfortable with them on. Valet parking is available for $6.50 per car. Two Michelin Stars, October 2007; James Beard Foundation, Outstanding Service Award, 2005; Gourmet Magazine, No. 4 Restaurant in America, October 2001; Food & Wine, Best New Chefs (Lee Hefter), 1998; Restaurants & Institutions, one of the "Best Young Chefs in America" (Lee Hefter); James Beard Foundation, "Rising Star" (Lee Hefter); Bon Appetit Magazine, "Chef of Merit" (Lee Hefter), 2004; James Beard Foundation, "Best Chef - California" (Lee Hefter), 2005; James Beard Foundation, "Outstanding Chef" (Lee Hefter), 2007; Food and Wine Magazine, Top Restaurant, 2000. * Please note that the restaurants featured at TravelsinTaste.com may have changed their personnel, menu, pricing, decor, hours of operation, etc., since our last visit. The competitive and creative nature of the fine dining scene virtually assures that changes will occur on a frequent basis in order to make diners happier, meals more pleasurable and visits more frequent. Given their frequent fluctuations, most restaurants welcome inquiries about their current hours, menu and more.